Nestled in the Chilterns, adjacent to the Ashridge estate, on the Tring summit of the Grand Union Canal, you will find Cowroast marina, a family run business, offering secure moorings for around 100 boats, with the benefit of parking your car next to your mooring. 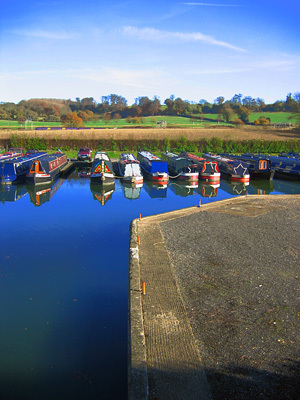 Located at the southern end of the Tring summit adjacent to Cowroast lock, Cowroast Marina is ideally placed for mooring in the South East. Just a few days cruising from London and the Thames to the south and the South Midlands to the north. Of Course we offer all of the usual services you would expect, engineering, slipway, narrowboat brokerage, a well stocked chandlery, and, gas, diesel, pump-out and elsan disposal. We also have Wi-Fi internet connection available via BT Openzone. C owroast Marina has been sold within the last 6 – 10 weeks and now belongs to the BW Marina portfolio. I know nothing more than this. It may be that things will change now it is no longer privately owned. I used to work in this area, (Still have boating friends there) and I used to often fill up with diesel there. The top pound (Marina Entrance has been closed to all boaters for the time being (canal bank leaking). I don’t know what special facilities have been made for the moorers, as the pound is to be lowered by 30cm due to leakage and all cruising from Cowroat to Tring (Tring resovoirs) has been ceared of all boatr and there is no cruising. Thanks Allan.Let us know if you have any additional information.